We're proud to announce the immediate availability of our new free software product: Html2Wiki. It's an extension to the wildly popular MediaWiki platform. 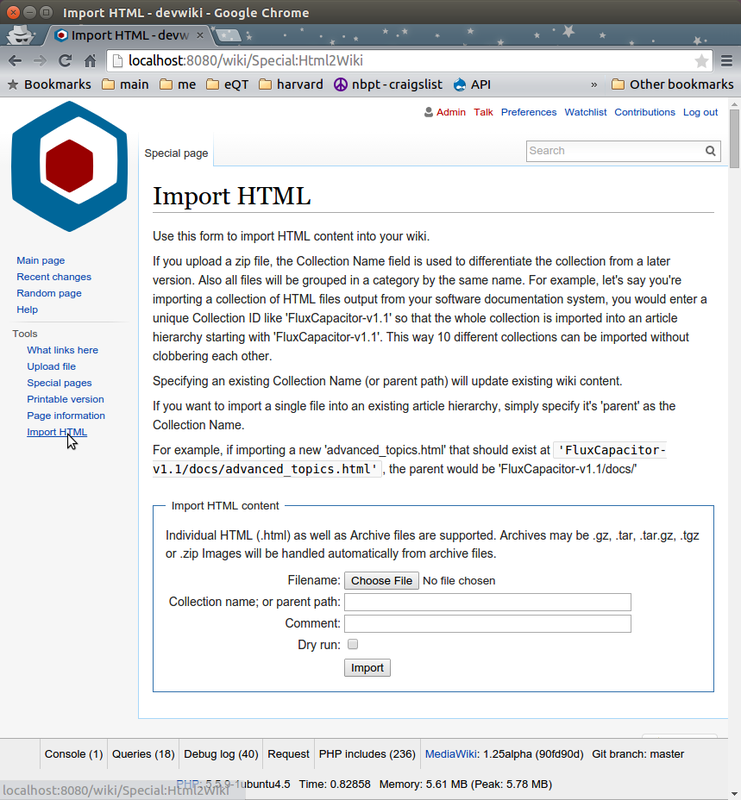 Html2Wiki allows you to select a zip (or tar) archive, and instantly import its HTML plus image contents into your wiki. This means that you can import an entire website, or a Google Doc into your wiki with a click of a button. Countless organizations and websites besides Wikipedia.com rely on the MediaWiki platform. They use it to create knowledge management sites, fan sites, documentation, or "intranets". The MediaWiki platform compares favorably with products like Microsoft SharePoint or services like Google Apps. To make it easier to bullk load content into your wiki, we've created Html2Wiki. Chances are there is a web page, or Google Doc that you want to import into your wiki. It's as simple as a couple clicks with Html2Wiki. In fact, Html2Wiki will even strip out the Google tracker from your Google Docs while it also saves the images to your wiki for you. Maybe you have a whole collection of HTML from an existing manual, or website you'd like to transform into a wiki. No problem. Html2Wiki will import your HTML collection using the 'subpages' feature of MediaWiki so that the whole collection of files is grouped together. If you'd like help with installing, configuring or extending Html2Wiki in any way, please let us know. We're happy to provide this tool to make your wiki even more useful. Any suggestions for features or bug reports can be posted to our public workboard.